Two source types, ExternalSphericalSource and ExternalBoxSource are available, and can be used to simulate an external radiation field (such as the interstellar radiation field or I). 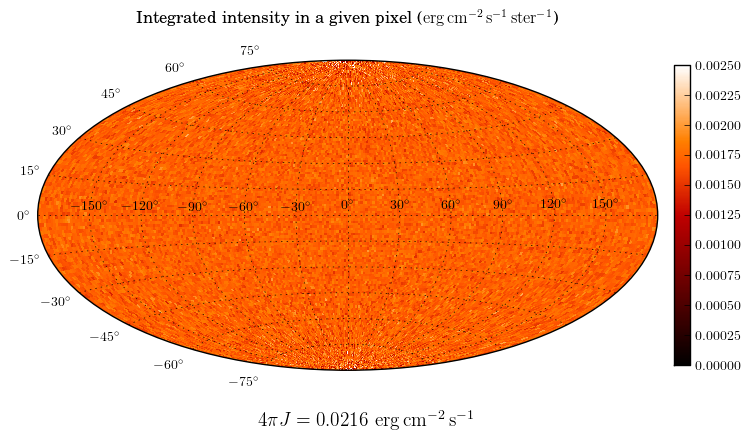 One of the tricky parameters to set is the luminosity, because one often knows what the mean intensity of the interstellar radiation field should be, but not the total luminosity emitted from a spherical or box surface. # important - the luminosity is set separately. fig.text(0.40, 0.15, r"$4\pi J = %6.4f$ "
ax.set_title(r"Integrated intensity in a given pixel "
As we can see, the value for is almost identical to the value we initially used above.